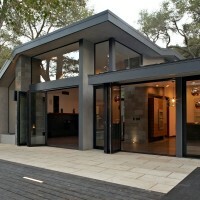 (fer) studio completed the remodel and expansion of the Kim Residence, located in California. 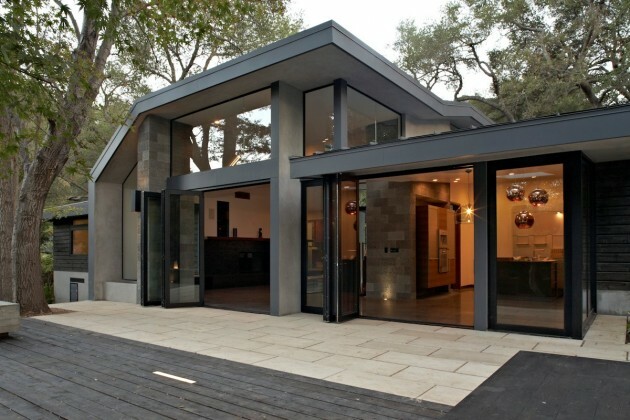 The Kim Residence project is an extensive interior and exterior remodel, and a 900 SF expansion of an existing 3 bedroom, 3 bathroom single-story ranch-style home from the 1950’s. The scope includes contemporizing the interior and exterior, expanding the existing kitchen and living room, adding a bedroom, and developing the landscape. 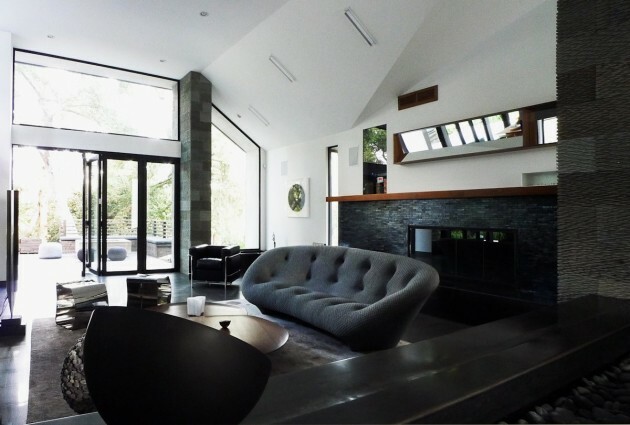 Through harmony and contrast, the Kim Residence accentuates the magnificence of its natural wooded surroundings. Barely perceptible from the street above, the Kim Residence, by form environment research (fer) studio, is designed to blend into the shadows of the La Canada foothills. 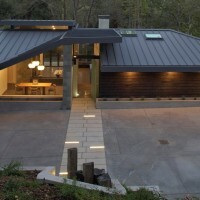 Set on a slope below the road and shrouded in native oaks and redwoods, the house appears to float under the folding planes of its dark roof, which glows from beneath, through lit clearstories and concealed windows. 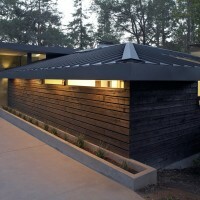 This gray standing seam metal roof, a defining feature of this enigmatic home, provides textural contrast to the black stained cedar exterior siding and the softness of the surrounding landscape. 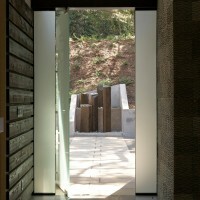 Approaching the residence down the sloped drive, the black basalt columns of a water feature puncture the ground plane of the restrained front entry court. From there, a single path of interlocking pavers, inlaid at intervals with LED bricks, takes visitors straight through the front entrance. 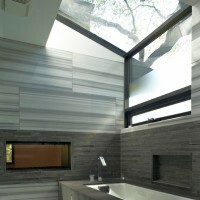 The spine of the home is organized along a primary north-south axis that is defined by a glazed open channel through the house that connects the basalt water feature and path at the south entrance and, in perfect alignment, the existing pool and a sprawling oak tree on it north end. 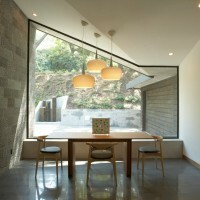 Shared materials, angles and sight lines through the house, make the transition, from outside in, fluid. The common areas of the home are arranged along this primary north-south axis. 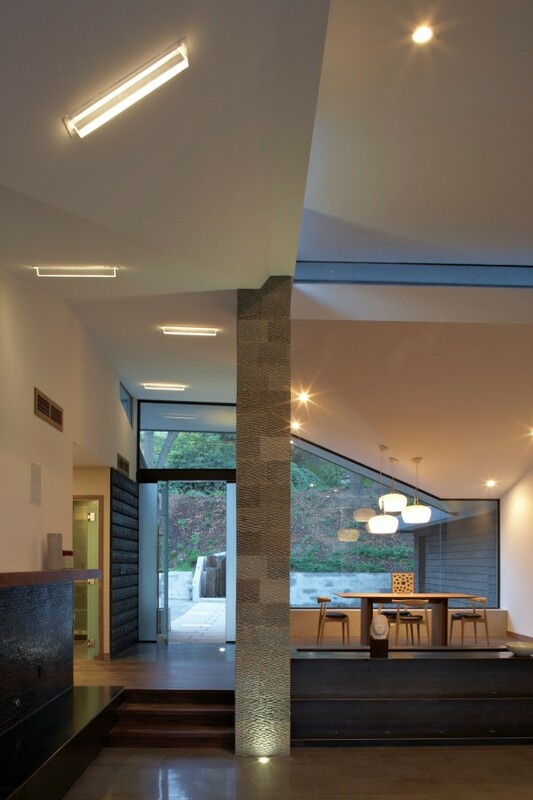 Through the foyer, around the textured Lada stone wall, the first gathering space is the formal dining area. It’s defined by a dramatic downward fold in the ceiling that is continued through the adjoining window that overlooks the front arrival area and wooded property. 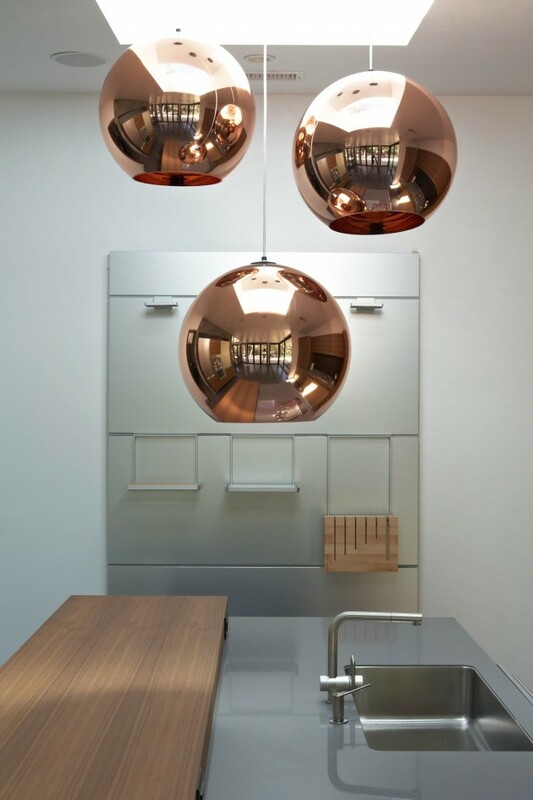 Billowy pendant lights emphasize, through contrast, the acute angularity of the space and the austerity of the natural color palette, materials and furnishings, designed to show off the views outside. common areas and intimate tucked-away spaces within the context of the larger family room. 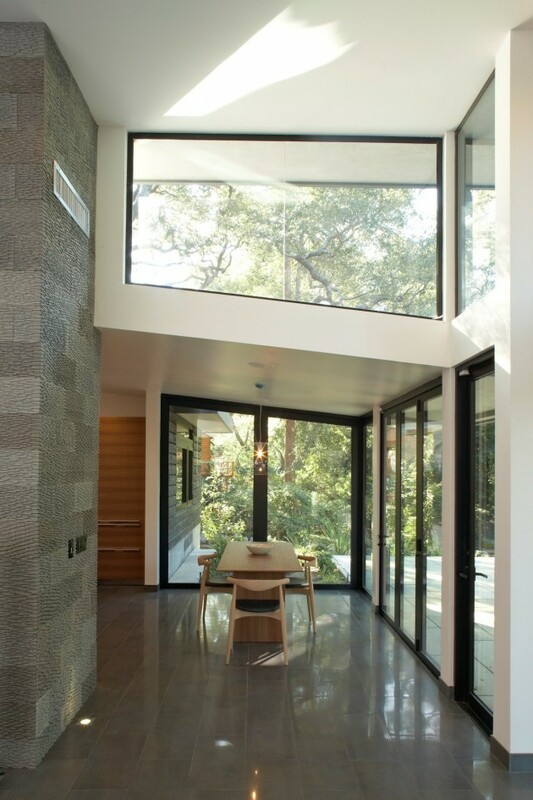 A tiled gas fireplace integrates a steel bench that wraps around the room and ends underneath the picture window that frames the property’s defining oak tree, at the north end of the primary axis. Bi-fold glass doors open up to an expansive cedar patio enclosed in sequoias and overlooking the sunken rear garden and pool. 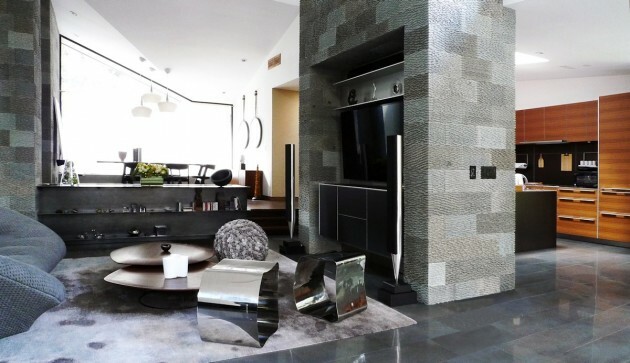 A central unit that houses the living room television on one side and kitchen cabinetry on the other, implies a separation between the living room and eat-in kitchen. 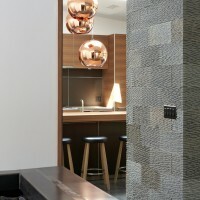 By comparison, the custom kitchen, by luxury brand Bulthaup, is one of the more enclosed areas of the residence but, like the rest of the interiors, it is strictly edited to wood, stone and steel. 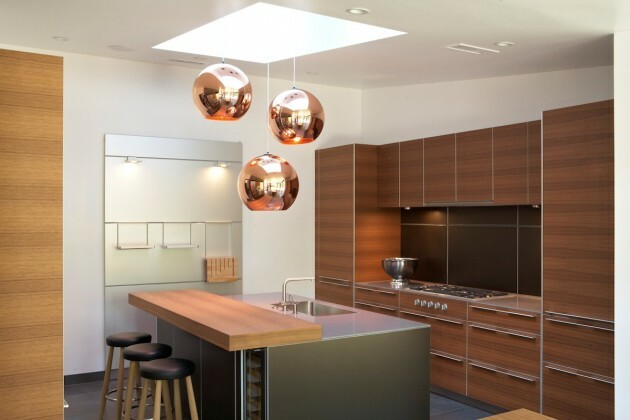 All appliances and accessories are concealed within the natural walnut veneer cabinetry to create a seamless contemporary space. 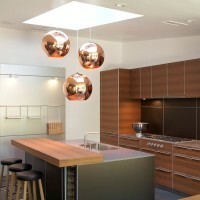 A stainless steel wall unit and matching center island countertop gleam underneath an overhead skylight, from which globed copper colored pendant lamps descend and reflect natural light. Attached to the kitchen, a more casual eating area is encased in glass walls and doors, lending a sense of dining al fresco. 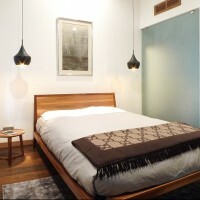 The private areas of the home are organized along the secondary east-west axis, increasing in intimacy to the east wing. The office, guest room, powder room and laundry, which connect to the garage, are grouped on the west end. The more private east wing includes a bedroom, bathroom and the master en suite. The master bedroom is anchored by a large dual-sided gas fireplace mounted into a striated marble wall that is shared by the master bathroom. 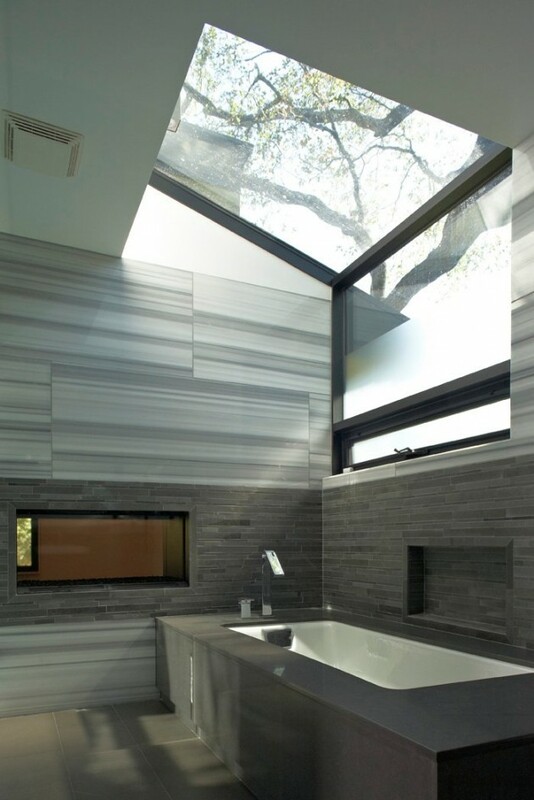 An oversized stone tub sits on the opposite side of the fireplace under a wraparound window that offers views of the woods outside. 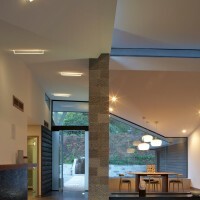 In the rear garden, [place]-pakshong landscape and architecture collaborative designed the landscape to follow the organic contours of the descending hillside, in contrast to the rectilinear design of the home. A common charcoal color palette and shade-loving woodland plant palette unify the house to its surrounding natural context. 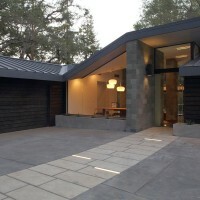 A simple flagstone path descends from the cedar deck behind the home, first to the hot tub, and finally down to the navy pool and adjoining stone patio, lit by three linear pendant lights that appear to float in the evening. 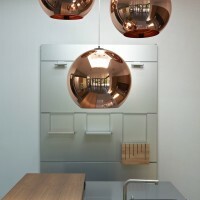 As with all (fer) studio projects, environmental sensitivity is part of the core design. 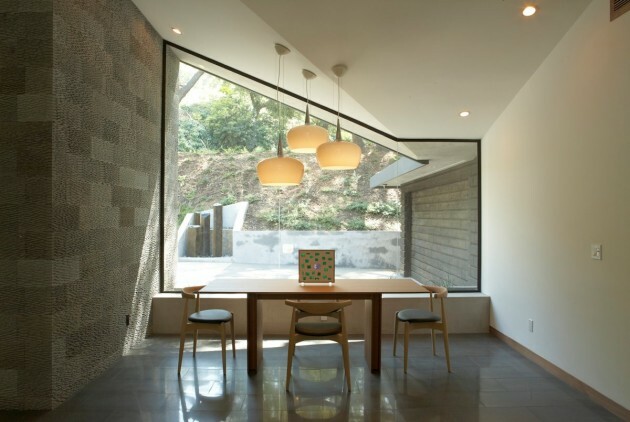 From the outset, (fer) studio reoriented the home to take best advantage of the sun-shade patterns of the site, to provide natural heating, cooling and lighting of both interior and exteriors spaces. 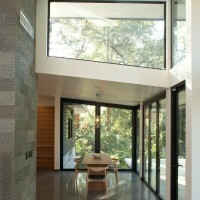 This includes siting the front entry court and back patio under a canopy of deciduous trees, to provide light and warmth in the winter months and cool shade in the warm La Canada summers; and the North-South axis of the glass clearstories and glazed walls maximize natural daylighting throughout the interior spaces, eliminating the need for artificial lighting during the day. The energy star rated standing seam metal roof and cool roof reflective paint keep the home at a lower temperature, reducing energy consumption for cooling by as much as 30% The exterior of the home and the garage door are clad in Western Red Cedar siding, a renewable resource that is harvested from sustainably managed forests. The back deck is also Western Red Cedar. All of the windows are low-E insulating argon-filled glass, which also reduces energy consumption by keeping the home cooler during the warm months and warmer in the cool seasons. A tankless water heater provides hot water on demand, countering the energy losses associated with storage water heaters. All interior paint is low-VOC, and recessed interior lighting is low-voltage. The landscape includes low-water plant material and natives, integrates low gallon per minute (GPM) irrigation, a smart irrigation controller that reacts to real-time weather conditions, and all exterior lighting is LED, which consumes significantly less wattage than tradition lighting. Project Team: Christopher Mercier, AIA, Partner; Douglas Pierson, AIA, LEED AP, Partner; Christopher Faulhammer, Project Manager; Linda Fu; Rob Nelson.